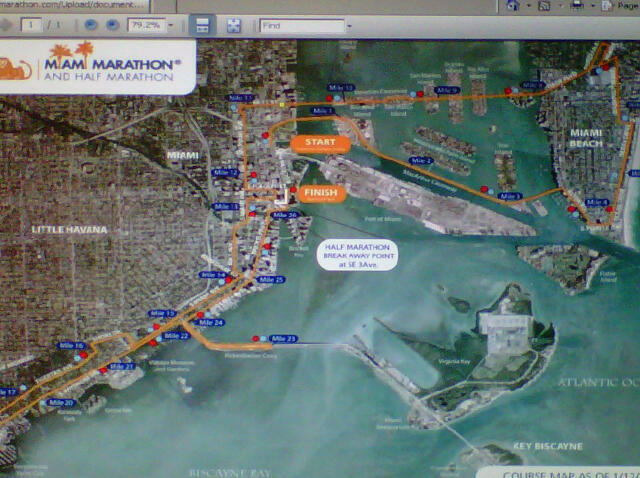 As time gets closer to the ING Marathon it is time for some planning. I will need to become very familiar with this map of the course. I will need to plan my stops and the emergency use of a port-a-potty in which I will try to avoid as much as possible. I’m thinking of dividing the full in two halves. The first half I plan to take it a bit slower trying save some energy towards the end. It has been my experience that I always feel better when my body is completely warmed up and have been running for about 45 minutes. I want to use that to my advantage and try to keep pace if I just take it slow at the beginning. Fuel is very important when running for so long. Keeping hydrated is key to a good performance. After experimenting with different types I have found GU gels to be my favorite. I will also need to plan when and how often I will be taking these. The big challenge lies on the Rickenbacker bridge which will be at mile 23. At this point I will not be too hard on myself and take a walking break if needed going up the bridge. I must know every turn and every bridge in order to plan and be prepared as much as possible. « Have you seen these?